Scene: Dr Felix Braithwaite’s office, fifteen years ago. The opening shot is of a crackling fire in the hearth, a clock ticks somewhere in the background. The camera pulls back and makes a slow pan of the room, coming to rest on the doctor at his desk. He is humming cheerfully to himself as he makes notes in a file, looking up when he hears a polite tap on the door. Dr Braithwaite stands up and turns to the filing cabinet behind him, opens the top drawer and replaces the file, before sitting back down and fixing a pleasant smile on his face. The door opens and a serious-looking man in a suit enters. Despite the fact he is smartly dressed, we get the impression he isn’t comfortable in these clothes, a look that men who are more used to being in uniform often have. The doctor rises to shake hands with his visitor and indicates a chair, waiting until the man is perched stiffly on the edge of the seat before speaking again. The camera focuses on the newcomer’s face; expression unreadable, eyes cold and watchful, as the silence in the room lengthens. Close up of the doctor’s hands, nervously fiddling with his pen on the desk blotter. Close up of the doctor’s forehead, as a bead of sweat trickles into a bushy eyebrow. A side view of the two men, facing each other across the desk. The doctor swallows, licks his lips and looks down at his hands. He seems to notice his own nervousness, puts down the pen and folds his hands in his lap. Almost immediately, he lifts them back onto the desk, clasping them firmly together, as if to restrain them from misbehaving and looks once more at the silently watching visitor. The man opposite inclines his head ever so slightly to indicate he understands, but continues to gaze with mute curiosity at his nervous host, until the doctor finally breaks. The man smiles in satisfaction. The doctor and his visitor walk down a hallway until they reach two doors, where an orderly seems to be keeping guard. The doctor stops to speak to the orderly, who nods, glances at the visitor and walks away, then Dr Braithwaite looks through a spyhole in the right hand door and nods, apparently pleased with what he sees, before motioning the other man to the door on the left, which he opens and both men enter the room beyond, closing the door behind them. Scene: A small observation room, containing a control console with an array of video screens and a selection of medical monitoring equipment. The doctor and his taciturn companion are standing in front of what is obviously a two way mirror, giving a view into the bare white room next door. On a bed in the white room is the young man, he appears to be asleep. The camera drifts over and focuses on his face, which is drawn and tense, hollow black rings around his eyes. The point of view changes, looking back at a reflection of the room in the mirrored wall as we hear the doctor’s voice and, after a few seconds the scene cuts back to the observation room. “You have documented evidence of the test, I’m sure.” The visitor’s voice is surprisingly soft, for one with such an knack for intimidation. Maybe he knew this and realised his strength lay in the ability to command silence so skillfully. He looks at the doctor, who nods, turns to the console and activates one of the video monitors. An overhead view of the young man’s room appears and the horrifying scene with the puppy is played out for the audience of two. At the point at which the dog’s body is hurled against the wall in a bloody mess, even the great Dr Braithwaite averts his eyes, but the calmly observing visitor simply nods, switches off the monitor and looks at the doctor. With that, the visitor shakes the stunned doctor’s hand, turns on his heel and leaves the room, closing the door softly behind him. The doctor is left gazing through the glass wall at the sleeping figure, his expression deeply troubled. 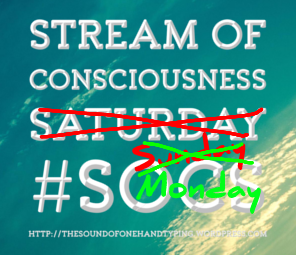 Posted by dalecooper57 on September 19, 2016 in Fiction, Guest spots., Literature and writing, Stream of Consciousness Saturday, The write stuff.